This is the most epic of Rave / Festival / Pimp coats around. The Yeti-Coat makes you feel absolutely magical wearing it! The Yeti-Coat is designed to keep you warm and and glowing all night , party till dawn, roll up in it, and sleep the morning away! It Fluffs as you walk and dance! It is softer than a baby Yeti's bottom. WARNING: Whether you like it or not, expect heavy petting from everyone and anyone. Featured in an article for Wire Magazine, a Yeti-Coat is huge crowd please at anywhere you go. The 600 total LEDs (220 red, 200 green, 180 blue) on a seemingly randomized fade pattern cause the internal glow to shift and flow like liquid rainbow. This XL full length (5.5ft length !!!) and stuffed to the brim with lights was sold for $2,200. Smaller models like jackets, vests, and leggings require less fabric, LEDs, and labor so anything can be made to fit your budget. 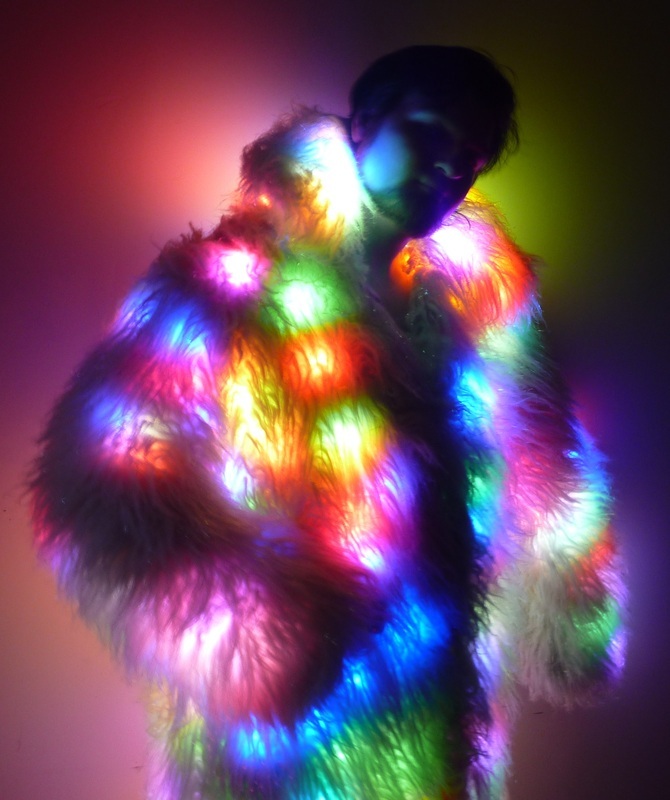 A new Yeti-Coat model using special addressable RGB LED's like my LED-Vest is being developed that will allow you to play live video and music visualizers for custom patterns. If you would like more info or want a Yeti-Coat of your own please do not hesitate to contact we with any questions or requests.